“The Encounter I” My studio has an abundance of resin and wood shards, artifacts from past projects, and salvage, things I cannot throw away. It is full of music as well and my mind wanders through the biblical stories of the Exodus, where guiding lights and columns of clouds and fire are found along a desert journey. Before starting work, I muse on some of my common themes in my work, the themes of healing and restoration. Bits and pieces of memory are stored in the shards of my work, time is captured and measured in these lifeless pieces. 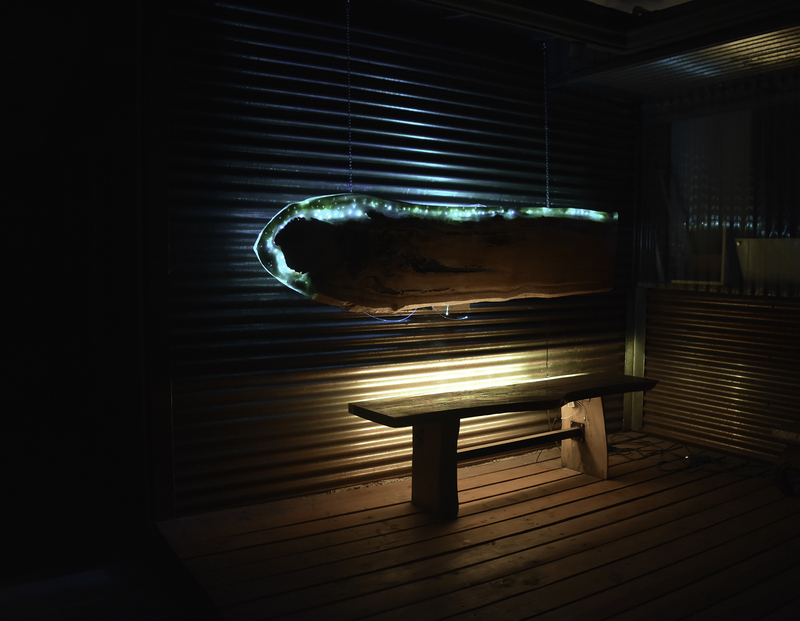 I look to release the memories contained by using the media of resin, LED lighting wood and steel. At times I think myself as an alchemist, looking to release the memories “stored” in the pieces. I am drawn to using resin, LED lighting wood and steel. I seek to create commonalities between materials, and the experience and memories. In this photo, I imagine the molded resin wings engulfing what looks like the heart of a being. The LED lighting pulsates colors through the translucent layers of cast resins. Healing, light, and restoration have become central themes in my work. My imagination is inspired by nature and depicting stories from scripture. I imagine a time during the creation of our world, the light, the formation of earth and sea. Stories of hope, healing, and provision while lost in the desert. LED and UV light is a medium that I use to illuminate my work. When I am in a wilderness environment, I imagine a time when the landscape was shrouded in chaos but formed to create meaning and mission where time, space and light dispelled the darkness as new beginnings emerge. The desert and the ocean have always been part of my life as has surfing, diving, fishing, sailing and exploring remote realms in Mexico, Central America, Alaska, and Hawaii. One of my favorite artist’s quotes comes from British artists Francis Bacon “The job of the artist is always to deepen the mystery”. 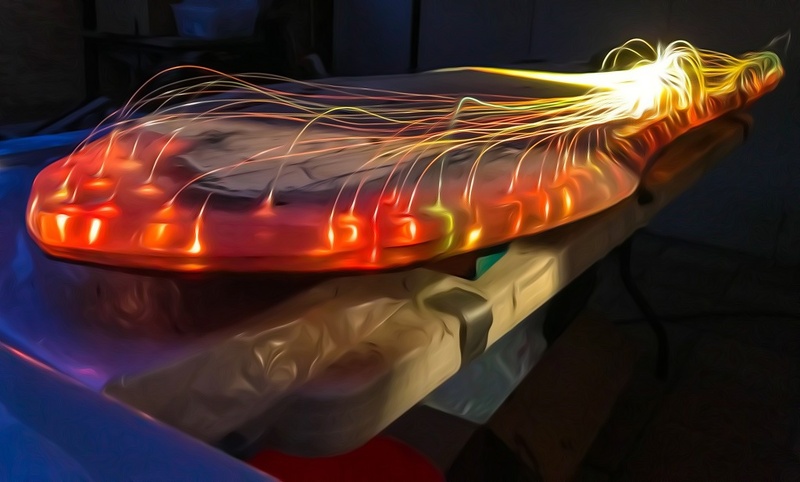 My feel my work has a mysterious nature to it, lights that penetrate the darkness and seemingly comes from within the work, light that pulsates a healing and meditative mood and helps penetrate the darkness. 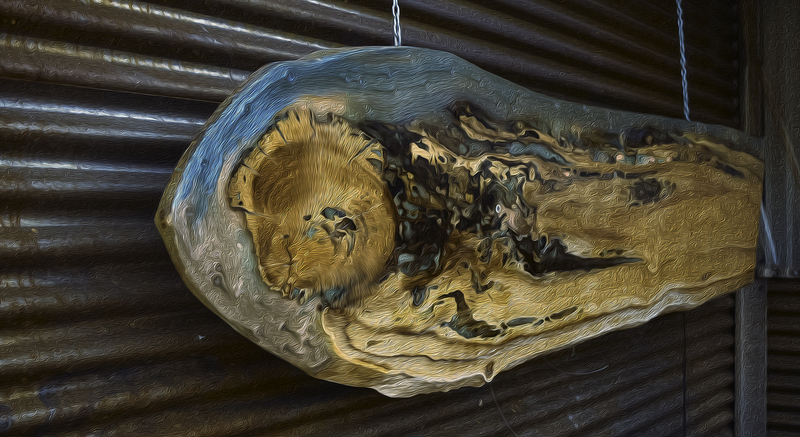 The Art Process I utilize resin, wood, steel and light in most of my pieces. The translucent nature of resin and how I cast and color resin layers creates skies, clouds, oceans, and landscapes. I mix phosphorescent powders into certain resin layers allowing me to “create” light in the darkness. I use LED and UV lighting to illuminate the resin layers and the light seeping through the resin creates a sense of wholeness, healing, and peace. The perception of these works shifts as the color of light is changed, at one point a sunset at another time a twilight in the desert or ocean landscape. Any light “charges” the phosphorescent layers in the work to produce a radiant quality…an eerie glow. That “glow” dissipates over time but may remain a subtle light throughout the night, only to be charged the by the light of a new day.